The UK referendum made the market volatile which was a historical event. While EUR will negotiate the UK regarding their exit, the UK remains a member of the Union till then. After EURUSD historical fall to 1.09110 this pair has been moving with bullish bias regardless of two pullbacks. 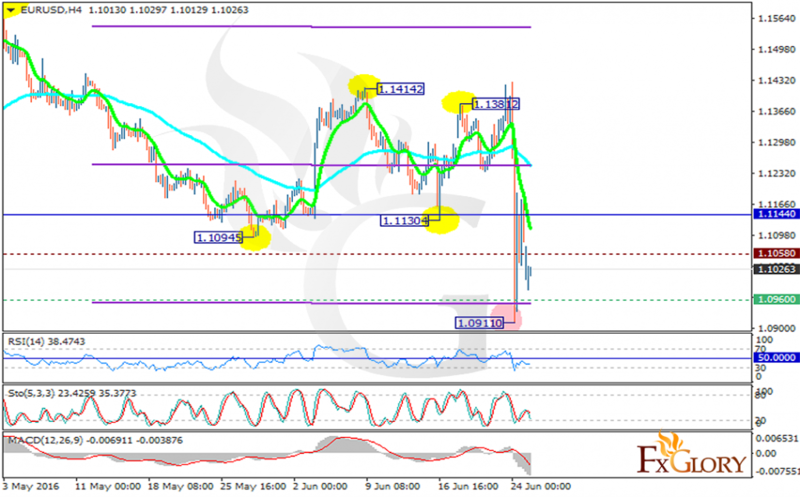 The support rests at 1.09600 with resistance at 1.10580 which both lines are below the weekly pivot point at 1.11440. The EMA of 10 is falling down and has passed the EMA of 75. All indicators are showing bearish trend at the moment; the RSI is below the 50 level, the MACD indicator is in negative territory and a the Stochastic is showing strong sellers. Sellers can target 1.0900 for this pair but as the pair is still under the influence of the UK referendum it takes time to go back to its stable place.